I’ve been ambling along with the same set of brushes for nearly two years now and I’ve been wanting to add some more to my collection. I’d heard good things about Zoeva brushes so I asked Harry to get me the Vegan brush set for Christmas. I opted for this set over the much hyped Rose Gold Set as I’m not personally a big fan of the whole rose gold trend. 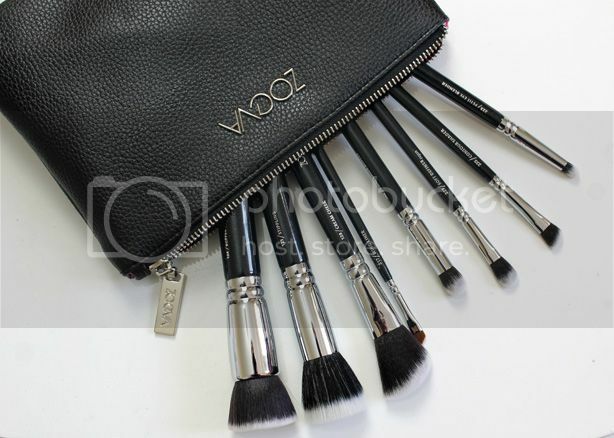 The brushes have vegan friendly synthetic taklon bristles and come in a lovely leather effect clutch. They’re also super soft and feel lovely to use on the skin. I’ve not had chance to use all of them but of the ones I’ve used I’ve been impressed. Buffer Brush – I absolutely love my Real Techniques Buffing Brush, so I was very excited to try this buffing brush out to see how it compared. It’s denser than the former and a bit bigger too. It reminds me of a cross between the RT buffing brush with the density of the RT Expert Face Brush. I really like it it gives a good finish and is lovely and soft on your skin. 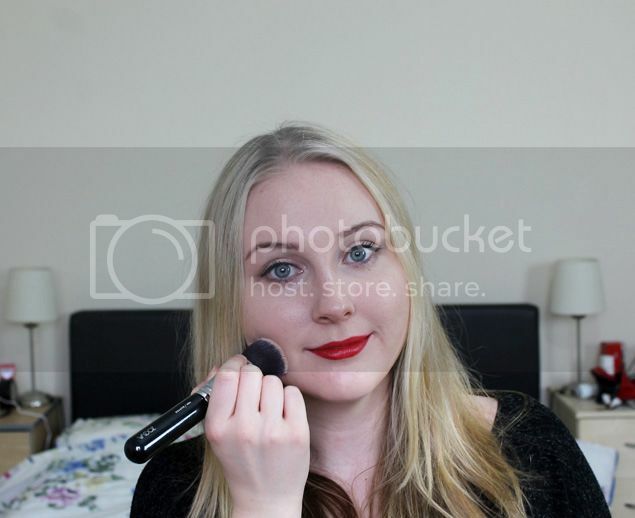 I found it does pick up quite a bit of product so perhaps I use a little more foundation than usual to get the desired coverage but other than that I have no complaints- it’s a fabulous brush. Stippling Brush – I’ve not used this brush yet but again it’s very similar to the Real Techniques Stippling Brush, which I do have to say I don’t get a lot of use out of in all honesty. I think this will probably be one of those brushes I don’t get a lot of use out of, mainly as I don’t wear cream blush very often and I prefer a buffing brush for foundation. However if you are someone who uses a stippling brush a lot, it does look like a good one! Cream Cheek Brush – This brush’s function is as a blush brush for cream and powder, but I find because of the shape it works really well as a contour brush as well. Again, it’s one of my new favourites as although I have the RT Contour Brush it’s not the same shape as this and I’ve found this one really easy to use and do a good job. Concealer and Buffer Brush – This brush is really good, it’s quite dense which I wasn’t expecting but it does a good job of buffing in concealer. I didn’t have a brush like this in my collection previously so this is probably one of my favourites as although it’s nice patting concealer in with my fingers, sometimes I want more of an airbrushed finish and I find my foundation brushes can just end up removing too much product. Petit Eye Blender Brush – This is a decent eye shadow brush, again it’s not really one of my favourites from this collection but it does a good enough job. I find it’s a little too dense and not really big enough when I’m applying eyeshadow, I prefer a Mac 242-esque brush but it’s decent, it’s all down to personal preference really. Vegan Soft Definer Brush – This brush is very similar to the Mac 217 which I love, but it’s not quite as good. It still does a stellar job when blending out a smoky eye but I did find when I’d been a bit haphazard with the contour shader brush I did have to get out my Mac to rescue the look as this wasn’t quite doing the job. However overall really good brush and definitely one I’ll be using a lot along side my Mac 217. Contour Shader Brush – I think this is probably one of the only brushes in the set that I’m not the biggest fan of, mainly because I find when I try and use this with a dark shadow in the crease it ends up going everywhere and I looked like I’ve been punched. In all honesty I prefer my Mac 252 brush, it’s easier to use than this one. Wing Liner Brush – This reminds me of the Mac 208 brush and I’ve used that a couple of times for adding a darker shadow to my lash line so I think I will probably do the same with this brush now. I haven’t tried it out with eyeliner yet so I will have to let you know how that goes. If you’re in the market for a new brush set or you’re just starting out I’d highly recommend these. They come with more or less all the brushes you need, are really soft and easy to use and easy to clean, plus they’re really good value – You get 8 brushes for just over £50, that’s just over £6.50 a brush! I’d say I probably prefer the face brushes to the eye ones mainly as I find my Mac brushes do a slightly better job, but the Soft Definer Brush and Wing Liner are still really good and the face brushes are every bit as good as the Real Techniques ones which I love! I got the rose gold set, but only because I found them for a reasonable price online. They’re so pretty and really brilliant to use, but I wish they didn’t need washing as often as they do! I didn’t know they did a vegan set, or I probably would have picked that one up.